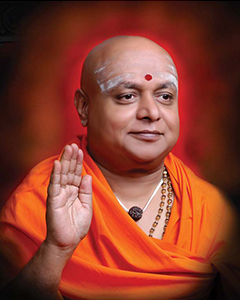 Sri Sri Sri Dr. Balagangadharanatha Mahaswamiji assumed the holy chair of Sri Adichunchanagiri Mahasamsthana Math in 1974. Poojya Mahaswamiji was truly an enlightened soul. He treated all the people alike without discriminating on the basis of caste, creed, gender or social status. His approach towards handling different problems was truly scientific and logical. He implicitly understood the importance of education to the masses in alleviation of poverty. Poojya Mahaswamiji was a great visionary with a perfect blend of science and spirituality. He was primarily instrumental in establishing Sri Adichunchanagiri Shikshana Trust that runs more than 500+ Educational institutions catering for about 130000 students across the country to impart quality education from primary to Professional Courses with a special focus on young people of semi-urban and rural areas. Mahaswamiji had a vision of serving the humanity in eight fold areas of Adhyathmika (Spirituality), Anna (Free Food), Akshara (Knowledge), Arogya (Health), Ashraya (Shelter), Anukampa (Helping Hands), Aranya (Afforestation), Akalu (Cattle Protection) was exemplary and noteworthy. He was rewarded and conferred with innumerable titles for his services in the field of Education, Health, Spiritual, Moral, Social, Cultural and Environmental activities. Most prominent among them are “Padma Bhushan, Doctor Honoris Causa, Saadhanaacharya, Akshaya Santha Sanatana, Dharmarathna, Seva Soorya, Vidya Samrat, Parisara Rathna, Abhinava Vivekananda, Rashtriya Ekatha Prashasthi” and so on.